November and Thanksgiving Day go hand in hand. On the 4th Thursday, families have the same plan at dinner time: sit down at the table to eat Stuffed roast Turkey. Thanksgiving is a day to celebrate with family and share experiences, enjoying typical meals and events that take place in each neighborhood with neighbors. People congratulate that day in advance. As traditions, the houses are decorated, creating a festive, warm and pleasant atmosphere. At the entrance doors they are prized from pumpkins of all sizes to crowns of nuts. And to the table, the star dish is the stuffed roast turkey. Today we want to share an easy recipe of stuffed roast turkey with which we will take Thanksgiving to your home. 1 turkey (6-7 kgs approx). 80 ml. extra virgin olive oil. We´ll prepare a paste with 3 cloves of garlic, salt and extra virgin olive oil. Stuffing the turkey with the carrot, the onion cut in half, ½ lemon, a bunch of parsley, and a little of the garlic paste and salt. We close the turkey with an oven cord. We´ll cover the entire skin with garlic paste, salt and oil. Place the turkey on an oven rack with the breast down and a tray to collect all the juice. We´ll cook the turkey for one hour at 392ºF. Then, we´ll turn the turkey around, covering it with aluminum foil and lower the temperature to 347ºF for two hours. After that time we will lower the temperature to 230ºF. The turkey will be ready when the meat thermometer marked 168°F in the thigh, and 160°F in the breast. 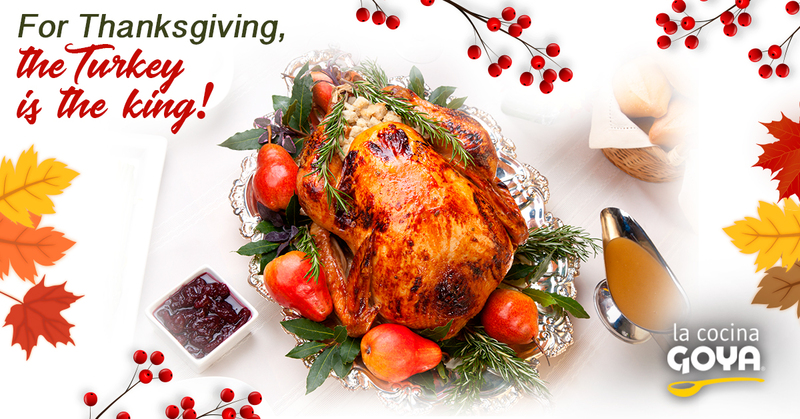 We will accompany the turkey with our ideas for cooking on Thanksgiving.